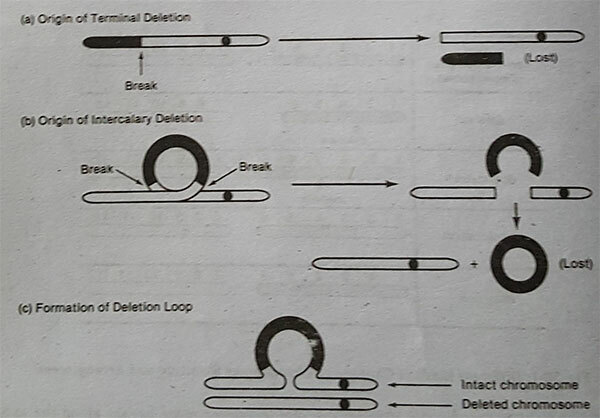 The chromosome deletion is also termed as (gene deletion, Deletion mutation, Deficiency or deletions) is a chromosomal aberration in which a portion of a chromosome or a part of genetic material (DNA) is lost during the process of replication, that missing piece is referred as Chromosome Deletion or Deficiency. The chromosome deletion or deficiency may be Terminal Deletion, if it is not produced at the end of the chromosome, or it may be Intercalary Deletion. If it occurs from interior of the chromosome. Both results from one or more breaks in the chromosome. The portion of the chromosome retaining the region of centromere will survive and the portion without the centromere will be lost after mitosis or meiosis in the resultant cells. During synapsis between structural heterozygotes (one normal complete chromosome and one with a deficiency), the unpaired region of the normal homologue “buckles out”. Such a configuration is called a Deficiency Loop or Compensation Loop. Loops can be observed in salivary glands chromosomes of Drosophilla. 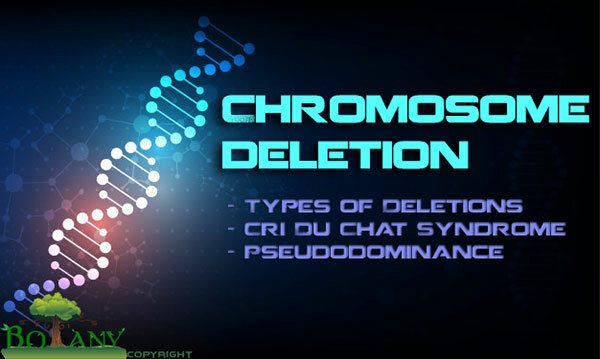 If too much genetic information is lost as a result of deletion, the aberration may be lethal, as in Cri Du Chat Syndrome in human beings, where only part of the short arm of chromosome 5 is lost. The child carrying this deficiency had a Cat-Like cry. The child will also suffers from Microcephaly (a condition in which the child born has a small head and a low mental faculty). A deficiency needs not to be very great to produce a severe effect. A final consequence of deletion may be noted in organisms heterozygous for a deficiency. Deletions or deficiencies have an effect on inheritance also. In presence of a deficiency, a recessive allele will behave like a dominant allele (Pseudodominance —— phenotypic expression of recessive genes in association with a deletion). The principle of pseudodominance exhibited by deficiency heterozygotes has been utilized for location of genes of specific chromosome in Drosophilla, Maize and other organisms. L. J. Stadler pollinated a homozygous recessive stock Maize with irradiated pollens from dominant stock, so that if irradiations induce a deficiency, recessive allele will express itself due to pseudodominance. If homozygote abc is pollinated by ABC, heterozygous F1 individuals (ABC / abc) will be produced expressing dominant characters. If pollen with dominant allele ABC is irradiated, a deletion may be induced leading to expression of pseudodominance by one or more recessive alleles. If meiosis at pachytene is examined in such a deficiency heterozygote, presence of loop will indicate location of gene. Several genes were located on different chromosomes of Maize, using this method. Deficiencies were also recorded in Drosophilla, particularly in X-chromosome in regions of genes w (white eye), fa (facet eye) and v (vermilion colored eye). Deficiencies have also been noticed in “waltzing mice” in region of gene v, inducing nervous abnormality.